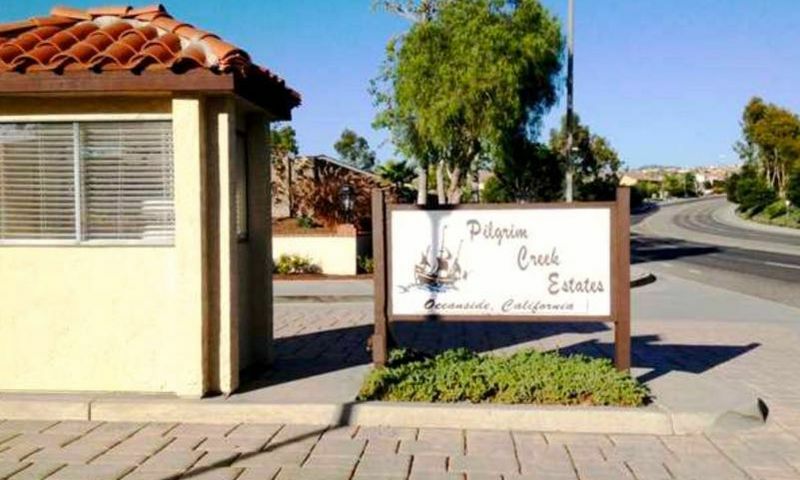 Pilgrim Creek Estates is a 55+ community located in Oceanside, California. This well-established age-restricted neighborhood contains 202 single-family homes that were developed between 1978 and 1990. Pilgrim Creek Estates provides residents with a well-equipped clubhouse where neighbors gather for social activities. Oceanside, California, is a terrific place to call home with a beautiful climate that's within driving distance to San Diego and Los Angeles that also boasts miles of beaches. Pilgrim Creek Estates is a 55+ community that residents love to call home. The clubhouse is the central gathering point for homeowners. Indoors, there is a ballroom for events and activities, while card tables are available for enjoying a game with friends. The clubhouse also has a billiards room, library, and a catering kitchen for preparing a meal for neighborhood get togethers. The terrific amenities continue outdoors with a pool and spa. A patio is perfect for relaxing on a gorgeous afternoon. Pilgrim Creek Estates also lets you say goodbye to expensive parking fees because there is an on-site R.V. parking lot. Pilgrim Creek Estates was developed between 1978 and 1990 and upon completion contained 202 single-family homes. Ranging in size from approximately 1,152 to 2,220 square feet, these homes offer two or three bedrooms, one or two bathrooms, and a carport or an attached two-car garage. Residents love coming home to jaw-dropping mountain views, bonus rooms, side yards, and open floor plans. Life within Pilgrim Creek Estates is filled with activity-packed days with like-minded neighbors. Residents make full use of the clubhouse by organizing games of poker, bridge, and bunco. There are also clubs for golf enthusiasts and R.V. owners. Getting to know neighbors is easy with holiday parties and potlucks. Stay in terrific shape with the aqua exercise group. With a homeowners' association that takes care of common area maintenance, sewer, water, and trash pickup, residents can spend their days as they please. Pilgrim Creek Estates is located in Southern California. Just around the corner from the community is Town Center North that has a Walmart Supercenter, Vons, casual restaurants, banks, and even more stores across the street at Mission Marketplace. The community is also just off of Highway 76 that leads directly to the beaches as well as Interstate 5, making traveling in the region a breeze. Scripps Coastal Medical Center is also just a short drive from the community gates. When farther travel is on the agenda, San Diego International Airport is less than an hour away. Homeowners will love living in Oceanside. The city boasts a pier, several beaches, farmers markets, art museums, and Mission San Luis Rey for the history lover. The Arrowood Golf Course and Marine Memorial Golf Course are both just a few minutes away from Pilgrim Creek Estates. For big-city entertainment, San Diego is a short drive away. Pilgrim Creek Estates is a beautiful active adult community in the highly desirable Southern California area. There are plenty of activities available in Pilgrim Creek Estates. Here is a sample of some of the clubs, activities and classes offered here. Pilgrim Creek Estates was developed between 1978 and 1990 and upon completion contained 202 single-family homes. Ranging in size from 1,152 to 2,220 square feet, these homes offer two or three bedrooms, one or two bathrooms, and an attached two-car garage. Residents love coming home to jaw-dropping mountain views, bonus rooms, side yards, and open floor plans. Please Note: Floor plans are not available at this time. 55places.com is not affiliated with the developer(s) or homeowners association of Pilgrim Creek Estates. The information you submit is distributed to a 55places.com Partner Agent, who is a licensed real estate agent. The information regarding Pilgrim Creek Estates has not been verified or approved by the developer or homeowners association. Please verify all information prior to purchasing. 55places.com is not responsible for any errors regarding the information displayed on this website.